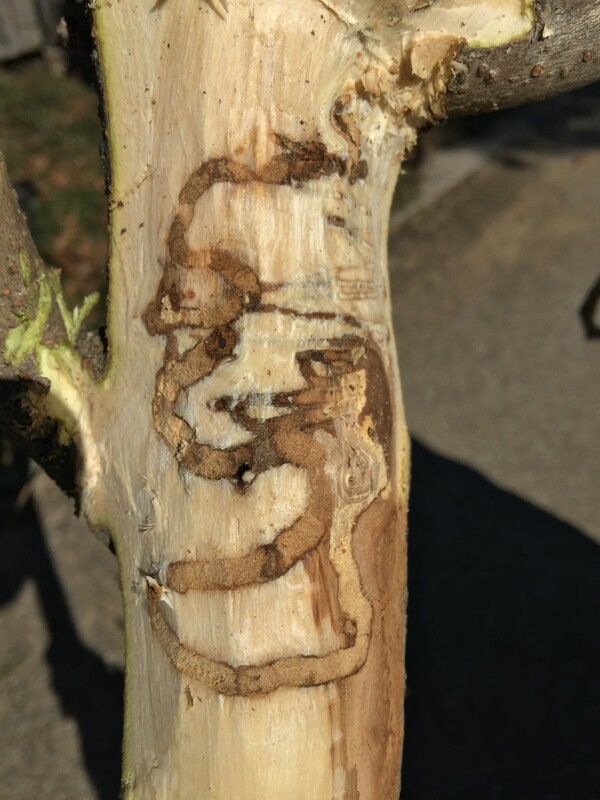 Emerald ash borer appears to have spread to a different host, and has now been found and confirmed at the Chicago Botanic Garden. But there’s no need for us to panic—it’s just an interesting find to document. As I blogged in late 2014, a college biology professor in Ohio (Don Cipollini, Ph.D., of Wright State University) discovered emerald ash (EAB) borer attacking white fringetrees (Chionanthus virginicus). Soon after his discovery in 2014, the Garden monitored its fringetree collection and found no signs of EAB activity on our fringetree collection (around 40 trees). Dr. Cipollini holds the limb on which we found emerald ash borer activity. Two weeks ago I had the privilege of meeting Dr. Cipollini here at the Garden and scouting our fringetrees with him. Cipollini and a Ph.D. student are studying EAB on fringetrees and are scouting known populations of fringetrees in areas of EAB activity. Where better than a Garden like ours with a documented collection of fringetrees? We scouted nearly all of our fringetree collection very closely. Cipollini knew exactly where to look (way beyond the obvious) and carefully reviewed each of the Garden’s fringetrees. About halfway through the scouting process, a suspicious sunken area was found on one tree. 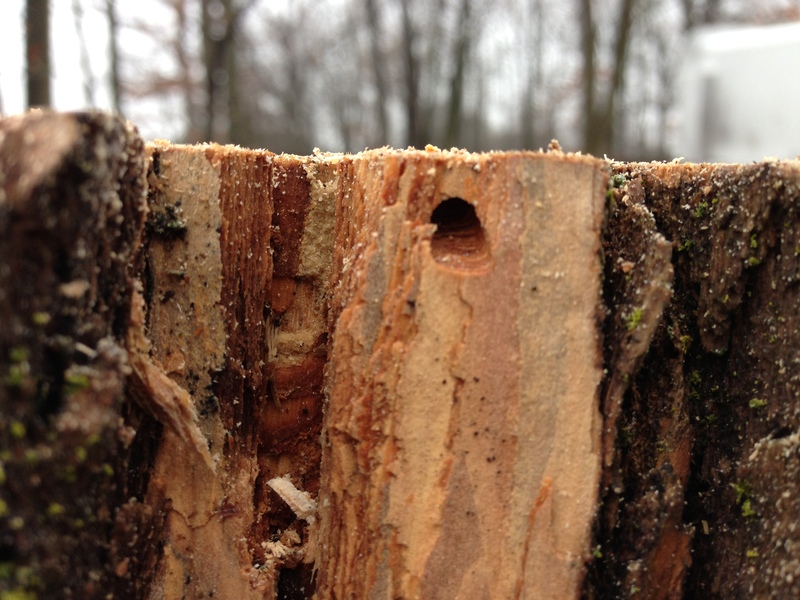 With a sharp chisel, a small section of bark was scraped, revealing a borer gallery. We later removed the limb and found a D-shaped EAB exit hole not far from the gallery. Cipollini indicated that he felt the damage was about 2 years old, and this coincides with time that EAB was at its highest level at the Garden. Of all the trees we very closely monitored, we found only one that had been very slightly damaged by EAB. The gallery left under the fringetree’s bark by emerald ash borer activity. We do not need to start treating our fringetrees for EAB or recommend it. 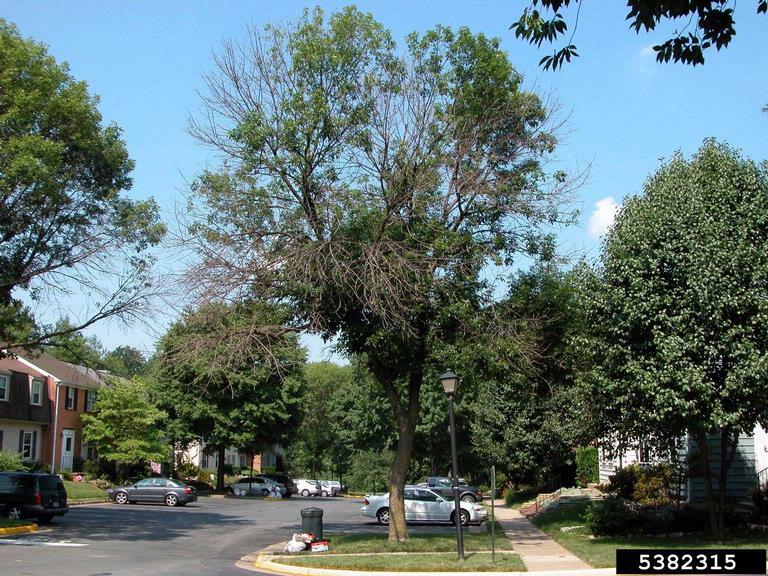 The damage is old, and took place when EAB was hitting the Garden the hardest a couple of years ago; so at very high population pressure, it makes sense that they may feed on another closely related tree or shrub. Ash (Fraxinus) is in the olive family (Oleaceae), as is fringetree (Chionanthus), lilac (Syringa), Forsythia, privet (Ligustrum) and swamp privet (Forestiera). These other shrubs are being monitored as well, but it is thought that they may not be an attractive alternative host, as the EAB does not seem to go after small-diameter branches that are prominent on these other olive family shrubs. As I mentioned in my earlier blog post, I do suggest if you have a fringetree that you look it over for signs of EAB activity. 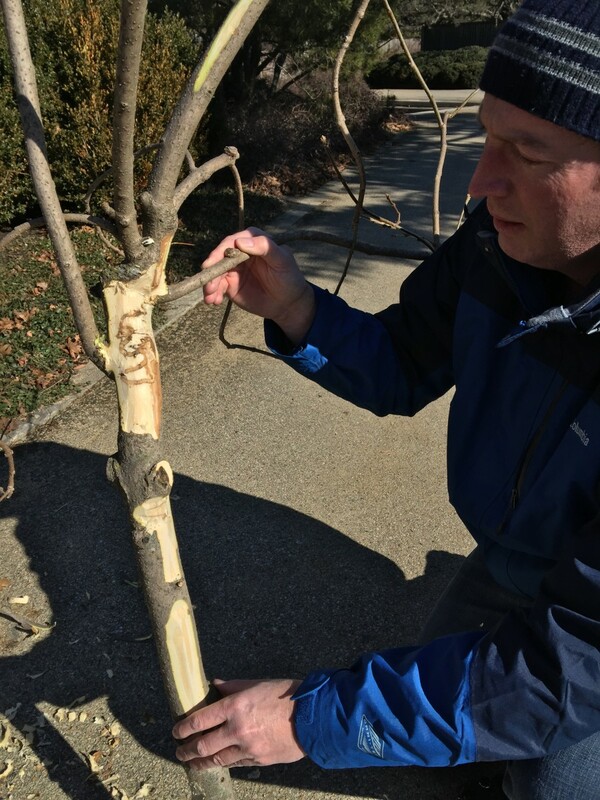 Last week, a college biology professor in Ohio announced he had found evidence that the emerald ash borer (EAB), an invasive insect decimating the continent’s ash trees, is also attacking white fringetrees (Chionanthus virginicus). In August he found the telltale D-shaped exit holes on a fringetree near his home. 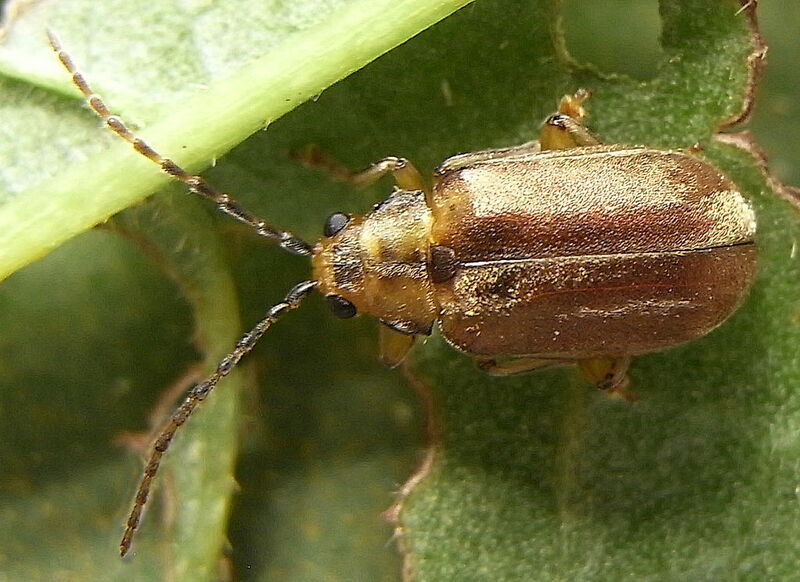 When he investigated further by peeling back the bark, he found feeding galleries and live borers. He had the borers positively identified morphologically as well as with DNA tests conducted by the USDA’s Animal and Plant Health Inspection Service (APHIS). He also found evidence of EAB activity on fringetrees in three other locations in Ohio. The recent discovery marks the first time EAB has been found completing its life cycle on anything other than ash in the United States. Researchers have been wondering whether the host range for EAB could be wider than just ash. That theory had seemed unlikely up to now but is proven with the fringetree discovery. There has already been a lot of research investigating other possible hosts, and with the new discovery, there will likely to be more. Is the insect adapting? This is a scary thought! Will EAB kill fringetrees as it does ash, or just cause damage? 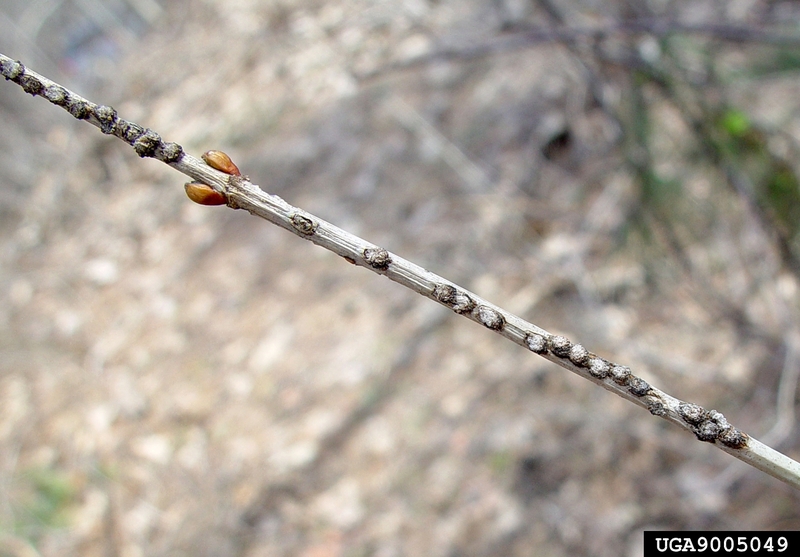 So far the invasive insect appears to only be damaging—not killing—fringetrees. Has EAB moved to fringetrees because EAB populations are locally so high? If the buffet is crowded at the “prime rib station,” it seems logical that “meatloaf station” may get some visits. 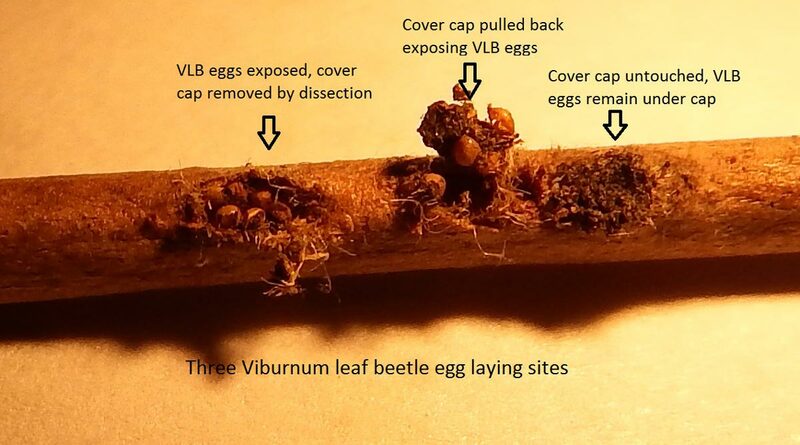 What will happen when ash tree populations dwindle? Will the EAB population die back, or just move to a secondary host (the meatloaf, as the prime rib is gone) and/or develop a completely new palate? This D-shaped exit hole was left by a mature emerald ash borer as it exited this host tree. The Ohio professor’s find was not all by luck; he had reason to focus on the white fringetree. Laboratory studies have shown that the adult EAB will feed on the foliage of other tree species in the same family as ash—the olive family, or Oleaceae. 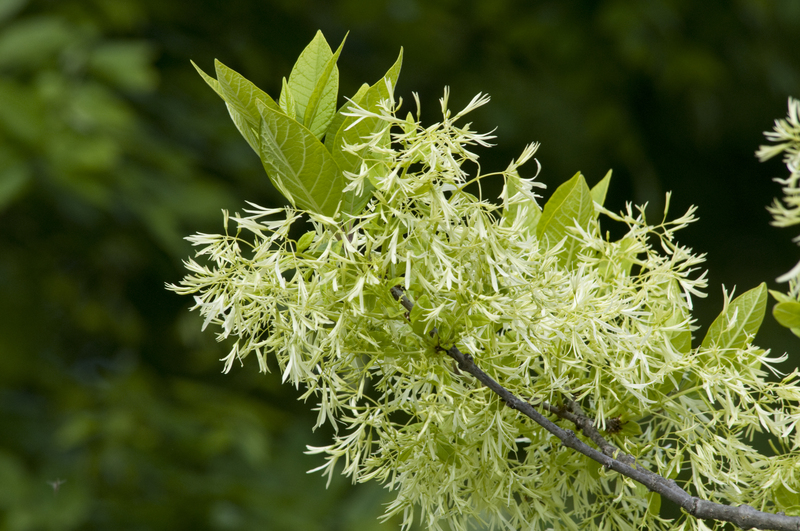 Members include ash (Fraxinus), fringe tree (Chionanthus), lilac (Syringa), forsythia, privet (Ligustrum) and swamp privet (Forestiera). Literature from Asia, the homeland of the EAB, indicates other secondary EAB hosts. The Chicago Botanic Garden has 42 fringetrees; all have been inspected and show no signs of EAB activity. Even a fringetree that is 25 feet from an ash tree that was heavily infested with EAB shows no signs. If you have a fringetree, you should inspect it for signs of EAB. 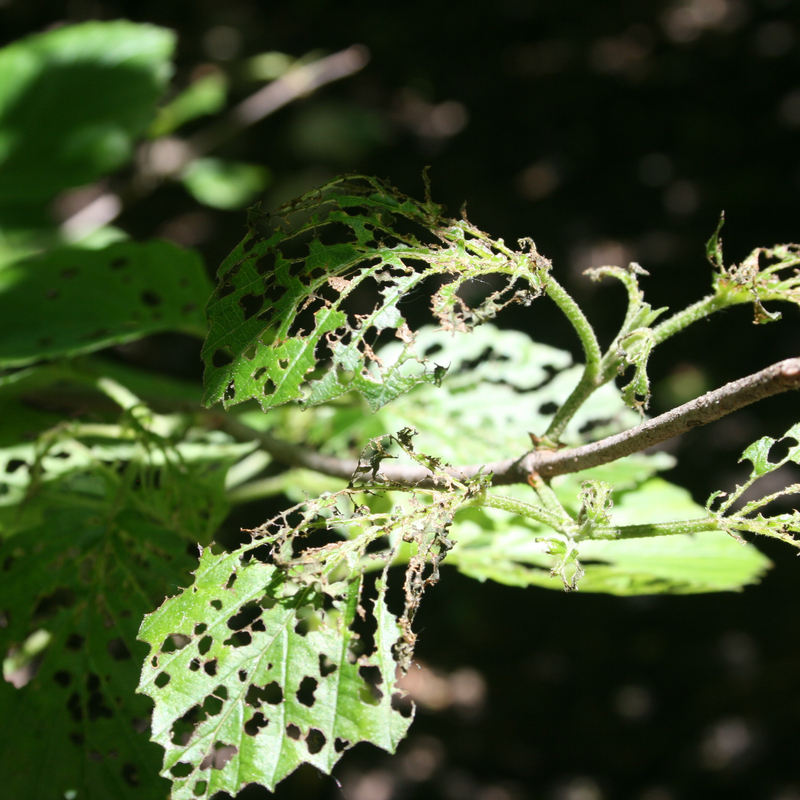 These include dieback starting at the upper limbs of the tree, new growth on the lower trunk, and small, D-shaped holes where the larvae have exited through the bark. Emerald ash borer larvae can kill a mature ash tree in two to three years by destroying the tree’s vascular system. Find more information on identifying and dealing with EAB on our website, and in our previous posts, Signs of Emerald Ash Borer, and Emerald Ash Borer: Sad But True, Part 2. As the world has become less fragmented by ease of transportation, more exotic, high-consequence plant pests and pathogens like EAB have entered—and will continue to enter—the country. 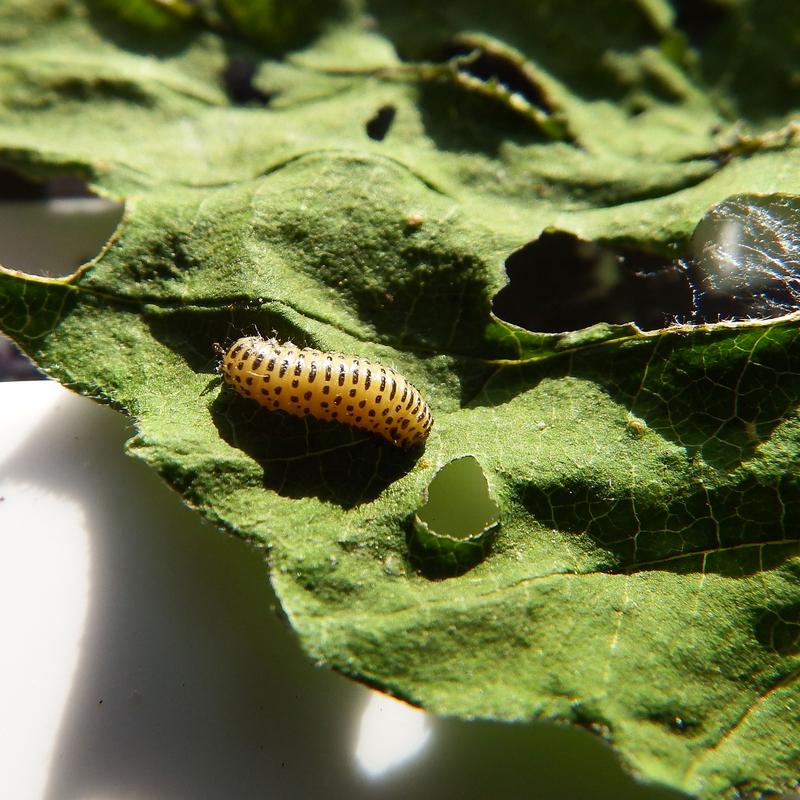 Other exotic plant pests and pathogens we are watching for at the Garden include the following: viburnum leaf beetle, Asian gypsy moth, brown marmorated stink bug, Asian longhorned beetle, thousand cankers disease, plum pox virus, chrysanthemum white rust, sudden oak death, and so on; most are already in the country. Vigilance and education are the key to managing and slowing the spread of these foreign invaders.